« AIFD Takes us to Africa! Wouldn’t you love to come home to this? This Highlander Haven was created by Loughran Landscaping LLC of Bala Cynwyd, PA. Nestled in the foothills of the Scottish countryside, this serene woodland garden reflects a balance between the man-made landscape and the beauty of Mother Earth. Natural stonework and masonry blend together, linking garden terraces and wild paths. In late spring, the raised flagstone terrace is engulfed in color rising from an abundance of azaleas, rhododendrons, hydrangeas and an assortment of annuals and perennials. As a polite reminder to Flower Show visitors, this garden is meant to be looked at, not lied in. But if you want this for your backyard, give the folks at Loughran a call. This entry was posted on March 6, 2010 at 8:00 pm and is filed under Garden Displays. You can follow any responses to this entry through the RSS 2.0 feed. You can leave a response, or trackback from your own site. 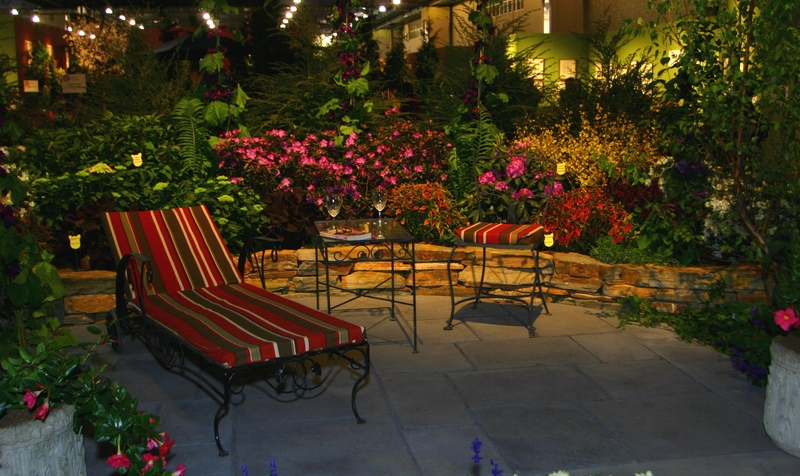 This is a beautiful landscape that would be an asset to any backyard garden.